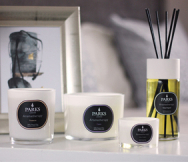 Parks’ lime, basil, and mandarin orange luxury gift set includes everything you could possibly need to set the proper mood in your home, including a natural reed diffuser setup, 100ml of premium scent, a set of four pure, natural wax votive candles, and a room spray—all in our unique blend of vibrant, peppery, and rejuvenating organic scents. Mandarin orange is a lively, joyful scent that acts as the base, bringing the subtler basil tones together with the sharper, spicier lime to produce what will quickly become the ‘signature scent’ for many of our customers. Basil has long been valued not just for its flavour, but for its scent. Modern aroma therapists say it has distinct stimulant properties, and can reinvigorate fatigued nerves through sensory presence alone. In more traditional medicine, basil is credited with aiding concentration and even improving reaction time. Lime essential oil is also considered a tonic, and its bright, spicy, and cheerful scent is certainly stimulating. It adds to the sweetness of the mandarin scent, but offsets this with its distinct tartness, which can never be mistaken. This is a complete gift set, and comes in a lovely presentation box. The four votive candles are highly decorative in and of themselves, and can be strategically placed throughout the space to add important visual as well as aromatic notes to the setting. The reed diffuser kit has everything you need to keep an area deliciously scented for weeks at a time, and of course, the handy spray is perfect for adding a last-minute splash.